David Killen is an art dealer in the Chelsea neighborhood of New York. He is also a treasure hunter of the modern variety, a profession a humble used machinery dealer like myself connects with. David is the kind of guy who frequents flea markets and auctions, not just because he needs inventory for his own bi-monthly auctions of prints and Tchotchkes, but because he loves the hunt. He’s 59 now and has been schlepping around art fairs and Swap-O-Ramas for 50 years. He thought that one day he might find an overlooked stash of value. It looks like he finally did. Late last year at an estate sale in Ho-Ho-Kus, New Jersey, Killen bought the contents of a locker in a warehouse. The property had been owned by Susanne Schnitzer, who was the partner of Orrin Riley, a prominent art restorer who had restored several paintings by the Dutch painter Willem de Kooning. Riley died in 1986, and Schnitzer was run over by a garbage truck in New York City in 2009. Schnitzer’s friends from New Jersey were her executors and they ultimately tired of paying the warehouse fees on the odds and ends in the locker. They had an auction house peruse the contents before they sold it, and it was pronounced “junk.” A bunch of prints of little value. Killen lives for times like this. The rules of the game in situations of this nature are that the bidders get a glimpse of the contents but cannot analyze the goods in depth. It’s a lot like bidding on a warehouse crammed with the flotsam and jetsam of 50 years of screw machining. ACMEs, Davenports and New Britains caked with chips, clotted oil and crud, chip conveyors and stock reels askew, making for an obstacle course tougher than an an American Ninja Warrior challenge. I’ve seen men fall into the base of 8-spindle ACMEs, never to be heard from again. Untitled XXXI, Willem de Kooning, Painted 1977. $21,165,000 at Auction. David Killen knew the locker’s contents had the “junk” judgement by the fancy auction house, but he also knew the history of Orrin Riley being a confidante of de Kooning back in the 1970s when nobody knew his name. A guy like Killen develops a nose for value over 50 years. Did he have special inside knowledge about the locker? No. I can say this confidently because he hauled the contents out last December in his own truck and didn’t even check everything out immediately. It was just another collection of dusty goodies that he would auction off in his sweet time. But then he saw the wooden boxes that said de Kooning printed on the outside. Maybe these weren’t prints. He had suspected there could be some gold in the locker when he bought it, or he would not have paid $15,000. He knew the background of Orrin Riley, who had done restoration work on de Kooning and begun the restoration department for the Guggenheim Museum. Riley was “big time.” David Killen’s nose for treasure smelled something sweet. Last week Killen made an announcement to the press that he owned six authentic, but unsigned de Kooning paintings. They were authenticated by Lawrence Castagna, an art restoration authority who had worked both for Riley and as a studio assistant for de Kooning. Castagna feels confident that six of the paintings are the real thing. 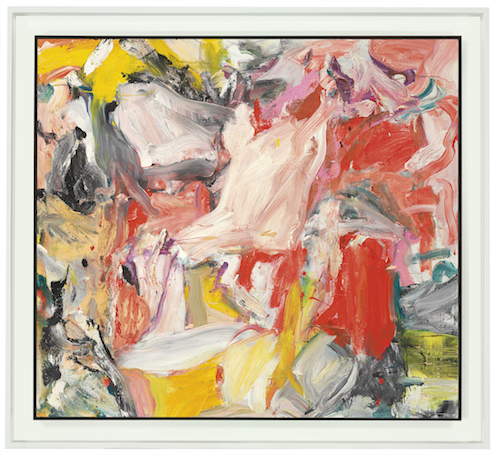 Willim de Kooning died in 1997, and his foundation in Manhattan does not authenticate works by the artist. Killen also found a painting by Paul Klee, the famous Swiss painter. The most recent comps on the seven original works of art, though the de Koonings are unsigned, would indicate a value of around $100 million for the group. What a haul for a struggling art dealer who deals mostly in nice prints. As a lifelong treasure hunter who has never found a de Kooning myself, I love this story. I am not jealous of David Killen. I am thrilled for him. His story is about the chase, not the pot of gold at the end of the rainbow. I could have done a lot of other things in my career, but the machinery treasure hunt and all of the fascinating folks I’ve met along the way has kept me passionately in the game. I love it as much as ever, probably more, because I am acutely aware of the time limits we all have. I really hope the de Koonings are the real thing, but honestly, I don’t think it will change David Killen much either way. At least I hope not. Question: Have you ever discovered hidden treasure? Treasure may not be a pot of gold, but a map to follow. My father, Leonard, started his career riding around in a truck with his Dad, an immigrant scrap dealer on the Southside of Chicago. In 1939 they were scrapping out an ice cream plant for the copper and my Dad spotted a 4” 8” red, bound, book which was the quarterly catalog of Emerman Machinery, a prominent used machine tool dealer. It contained Emerman’s extensive inventory with pictures and prices and descriptions. My father kept the red book, and after my Grandfather died at the age of 54 in 1941, my father liquidated the scrap business and set out on the road looking for used machinery using the Emerman Red Book as his road map. With World War II just beginning he concluded that if he could buy near Emerman’s selling price of 1938 he would prosper. What was the Emerman Red Book worth? PRICELESS. Treasures. I am a treasure hunter! I can’t believe nobody else commented! Life is full of treasures in places you never expected. I found my fiancé on OK Cupid. Hidden treasure! Hidden amongst a bunch of nice prints, there laid an authentic masterpiece. I have a great antique mirror I found in the alley behind my condo. We found a Hydromat carcass inside a container behind a bunch of rubbish that had been there for a decade. I found Trattoria Mario, my favorite Italian restaurant in the world, by accident as I was looking for a place to eat lunch in Florence, Italy, while studying abroad. Thousands of restaurants and I found the best one. Treasure. Unfortunately it appears readers did not get it when we asked them to talk about their treasures. Just bought a Solid Top Steel String Washburn Guitar in great condition at a second hand store for $85. I also once bought a bought a violin at a second hand shop. When I peered through the F-hole I caught sight of the name Stradivarius! Although it was not a treasure-hunter’s dream it was still a pretty good $10 dollar’s worth.